Continued to talk to with stakeholders… more meetings. Team self-organized and got some work done. I went on vacation (sorry team! ), but not really because I still read email every day, thought about the team every day, and read from my ever growing mountain of suggested work reading. Continued to talk to stakeholders… more meetings… see a pattern? Continued to work on team dynamics, including normalizing team flow times, team definition of done, workflow & standard operating agreements. Agile training with Bob Galen and we made a list of other Agile team goals we need to work on. 1. Distractions are really bad for Agile Teams. I have allowed the team to become distracted by outside influences… a lot of them. In trying to include everyone in the decision making process, talk about what was cool and new, attend meetings to learn what other teams were doing, talk to folks outside of IT on what they were doing, insert random topic here, I probably exposed them to more conversations/meetings then they could generally tolerate. The noise of the incoming “please help us make this better” was and continues to remain hard to ignore. 2. Don’t be afraid to fail. My A-type personality initially tried for the “perfect roadmap” and I learned pretty soon that wasn’t going to work. We need to focus on and try to address what is most painful now before I could ask the department to talk about what was next. See Broken Windows Theory and The Pragmatic Programmer Quick Reference Guide. I didn’t include all of the right people in conversations. I didn’t even know some of them were out there! I focused too much on our development community in the first initial few weeks… and hey, surprise! we have an operations community that is equally needful. I’m still trying to figure out how to incorporate our multi-geo teams into the conversation so they actually feel like they have a stake in the game. Now that I’ve bored you to tears… Here is Team Inception’s “easy button” method to help populate that question mark. 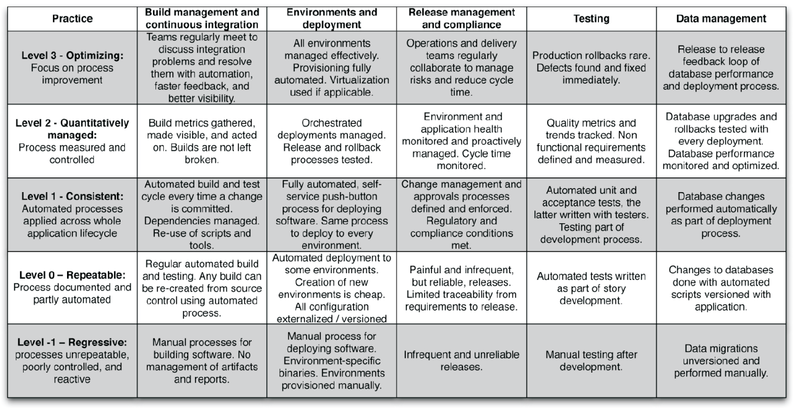 Use Jez Humble & David Farley’s CI/CD maturity model. Any model will work, though. If that is what is holding you up; stop talking, start working. Complete a survey to find out where your teams are. Look at the definition of where you are and where you want to be… and state what needs to happen to change. If your stakeholder community generally feels they are at Level -1 and want to be at Level 0, list what high-level things you need to do in order to achieve that. Hint: the maturity model gives you the answer. Now that you have a high-level list, order them in priority based on stakeholder feedback. Don’t take a whole lot of time here. If you are working in an Agile construct, you can always change the order if something doesn’t stick or feel right. Starting with your #1 priority item, define what it means for your department. As an example: we went through these steps and selected “automated deployment to some environments” for an initial focus. Our current and ever changing definition below. Anything else? Leave your responses in the comments!